With great joy we welcomed our first born daughter, Katelyn, on October 30th 2008. As an infant Katelyn struggled to eat and gain weight and was slow to meet developmental milestones. When Katelyn was 12 weeks old she was rushed to Seattle Children’s Hospital in status epilepticus, a prolonged, life-threatening seizure that would not end without medical intervention. The Northshore paramedics and wonderful doctors at Seattle Children’s saved Katelyn’s life that night. This episode marked the start of Katelyn’s chronic health problems; intractable seizures, a movement disorder, low muscle tone, poor vision, low energy, dysautonomia, impaired immune system, and numerous sensory issues. She was diagnosed with a neurological syndrome called malignant migrating partial epilepsy of infancy (MMPEI). The prognosis for children with MMPEI is devastating– intractable seizures, developmental regression, and a very short life. While hospitalized, Katelyn was very fortunate to be seen by Dr. Saneto. He changed her meds and almost immediately Katelyn’s seizures decreased. Katelyn continued to need frequent rescue medications for seizures, so Dr. Saneto arranged for Katelyn to begin the ketogenic diet at 18 months. Dr. Saneto felt that a mitochondrial defect was the underlying cause of Katelyn’s MMPEI syndrome. A muscle biopsy confirmed that Katelyn has a profound deficit in her mitochondrial complexes 1 and 3. 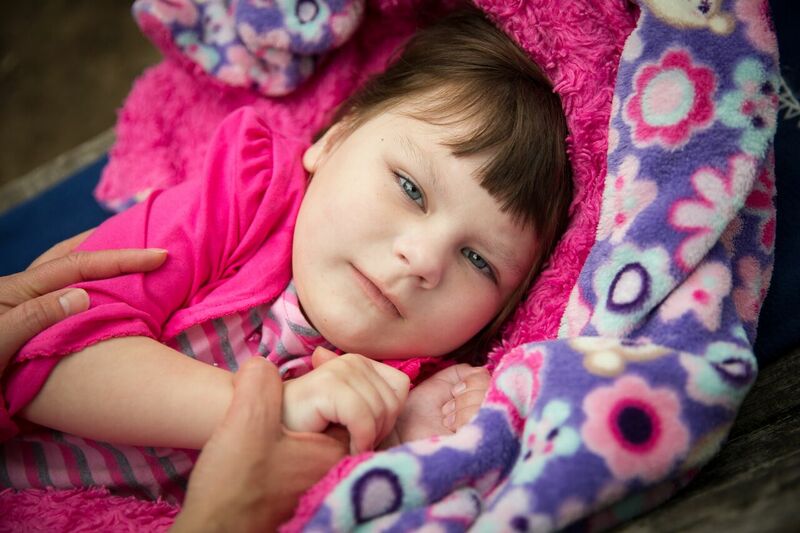 At nearly 7 years old, Katelyn is profoundly delayed in all areas. She will always be 100% dependent on us for her care. Katelyn is G-tube fed, non-verbal, and her low muscle tone makes her wheelchair dependent. For the first 3 years of Katelyn’s life we lived each day in fear it might be her last. Shortly after her third birthday Katelyn was enrolled in a compassionate use clinical trial for the first ever drug to treat mitochondrial disease. The EPI-743 treatment stabilized, and dramatically improved Katelyn’s quality of life. Her seizures decreased dramatically, and we no longer lived with the daily fear that the next “big one” would take her from us. EPI-743 decreased Katelyn’s chronic pain, and she regained the ability to smile, laugh, and make eye contact with us. Amazingly, our sweet little girl who was always so sick was finally strong enough to go to school! EPI-743 improved her immune system so dramatically that she made it through almost an entire year of developmental preschool with no sick days! The Northshore School District was amazing, and arranged for a nurse to ride to school with Katelyn, help her with school activities/therapy, and ride the bus home with her. Without EPI-743, Katelyn would have been home schooled or missed most of the year due to illness/hospitalizations. In January 2015 Katelyn went into status epilepticus and had a metabolic stroke that landed her in the ICU for several weeks. Katelyn lost a great deal of mobility on her left side, and she has a persistent left facial droop. We were blow away by how hard Katelyn fought to regain milestones like sitting and bearing weight on her legs. She is a true rock star! Katelyn’s droopy smile is a very real reminder of how close we were to losing her in 2015, and we are grateful that our family is still blessed to enjoy her infectious laugh on a daily basis. We are proud that she teaches all she meets the joy of unconditional love. Katelyn’s experience with EPI-743 treatment shows that supporting “mito” research can have a tremendous impact on children and families dealing with this terrible disease. We feel so blessed that Katelyn receives excellent care from Dr. Saneto, Pam Sligh RN, and keto-dietician Aaron Owens at Seattle Children’s. We thank you for your support of the NW Mito community, and hope that our amazing daughter Katelyn will inspire you to help us find a cure.